When it comes to the décor for your outdoor room, you might be thinking about how natural and beautiful it looks already, but have you thought of adding some natural accessories to your outdoor kitchen, patio or gazebo? You want décor that is both comfortable and harmonious with your landscape design. Decorating outdoor living spaces is versatile, so you can make sure to make the most out of what is available. So when the time comes to decorate that outdoor space of yours – think of some of these points before jumping ahead. 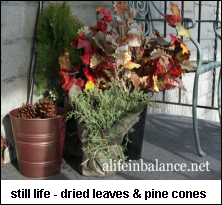 Before you dispose of items in the backyard that once had no use such as twigs, dried flowers and berries, or pine cones – think of how much beauty they could add to the outside area that you’re decorating. They can be natural, beautiful touches to spruce up the area and make it more outdoorsy. Pruning your trees? Have a larger limb cut into thin sections to use as outdoor coasters. Save the blooms from hydrangeas and hang them to dry – they make beautiful floral arrangements. If you have nothing in your immediate backyard, then take a look around while you’re on a walk. With a little hunting, you’re able to find an abundance of stuff to use for decorations around your outdoor room, patio or gazebo. Look at flowers or unusual items that you find along the way. A day at the beach or lake shore can yield all kinds of treasures. Larger driftwood pieces are great accents for rock gardens, and shells make terrific ash trays. 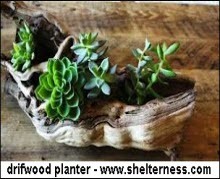 Smaller driftwood chunks with depressions or hollow areas make terrific planters. Make sure to keep in mind that you’re able to mix up a bunch of different looks when it comes to the mini landscape that you’re putting together. This natural décor can stand out from all the rest when it comes to providing a beautiful wonderland right in your backyard – made from all natural materials which means that you didn’t have to purchase any of it. Gather dried grasses, bark, leaves, etc. to mix different still lives together in baskets, tables, lamps and so on. Be creative and make sure to use a few different colors to stand out amongst the view behind it. We specialize in the design and installation of outdoor rooms, so if the natural decorating bug has got you, give us a call to arrange a free consultation to discuss your ideas for a natural getaway spot in your own back yard. We also offer custom-crafted natural stone furniture pieces to accent your outdoor living spaces. You can have a beautiful outdoor area all your own to decorate and make part of your home. Call today – 952-272-1772.